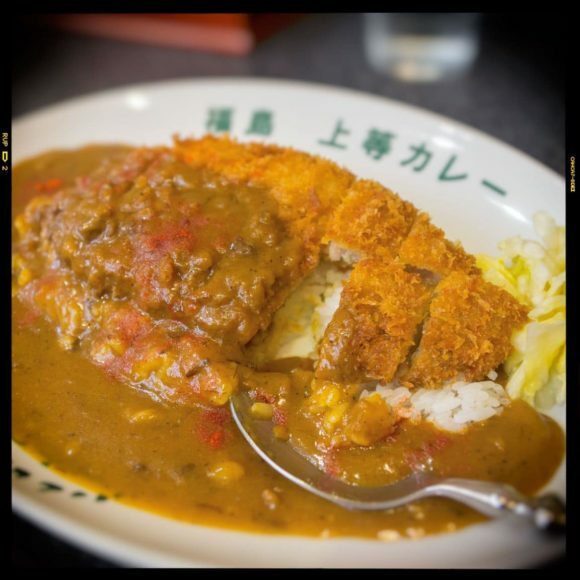 in 2011 I visited Osaka and had a super-spicy curry at 上等カレー near Tsukamoto Station. It was soooo hot that I was in a daze. Mariko and the kids said I was crying, but I beg to differ! My eyes were watering, yes, but that is different, isn’t it? Also, I had a sort of hiccup due to the extreme heat and it hurt to breathe too quickly. My facial muscles were slack. Take a look at the photo below and see for yourself. 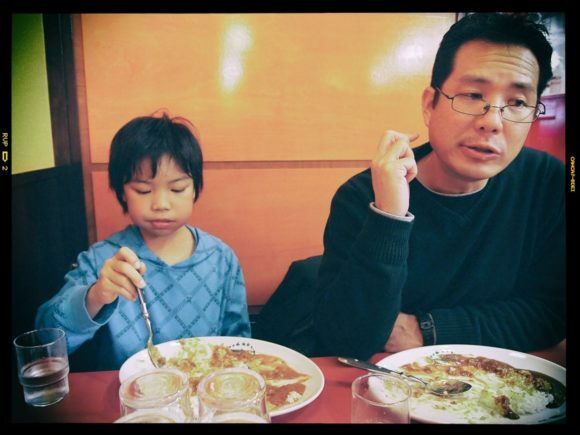 Regardless of how each of us recall that meal, the memory of it is a great one, and I wanted to experience the same spiciness during this vacation as the one in 2011. So I asked Mariko if we could go to the same curry shop, but she said there was a branch of the same shop near where we would be that day and that we should go there. Sounded good to me! Outside the shop is the ticket vending machine where you choose what you want to order, and put in your money. We noticed that there was no options for spiciness level and that kind of set off some alarms. We ordered the regular curry and saw that there were bottles of chili powder on the tables so you can adjust the level of spiciness yourself. I added a few dashes, and it still wasn’t as hot as it was in 2011. Back then, the cook just asked us how spicy we wanted it, and I told him “very spicy”. But now, the self-serve chili powder just wasn’t cutting it! I added several more dashes of powder, but it wasn’t getting any hotter – I think I maxed out that chili powder’s capabilities. I was pretty disappointed. The curry itself was pretty tasty, but I was hoping to have the same experience as before! 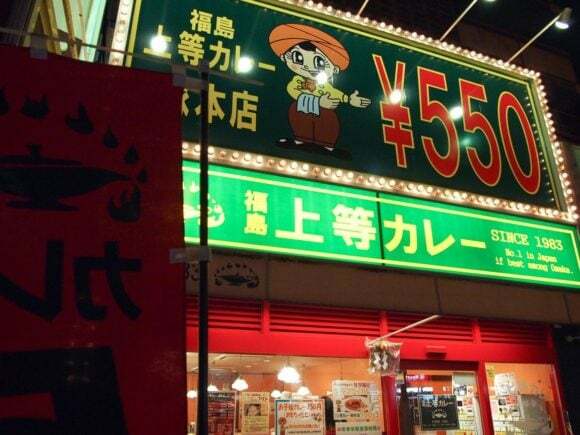 So, for the next time, I asked Mariko to do a little research so we can visit a curry shop with super spicy curry, just like the one in 2011. In fact, we might try the Tsukamoto shop again, but I don’t know if they will just have the self-serve chili powder which would be disappointing. Just for reference, if you are familiar with Coco Ichiban Curry, where they have a spiciness level 1-10, I normally will order the level 10. I’d say the curry in 2011 was probably a 15+.